Hi Everyone! Have you ever stopped at the farm stand or farmer’s market in the Summer, come home and found yourself with so much fruit where you don’t know what to do with it? 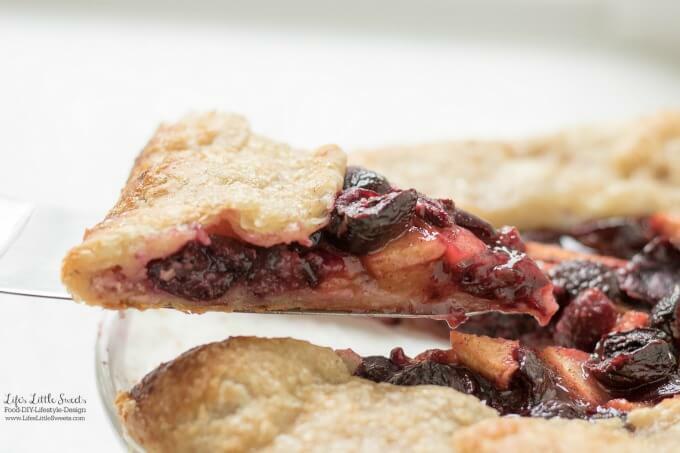 This Cherry Nectarine Galette is a great way use up fruit or excess fruit. 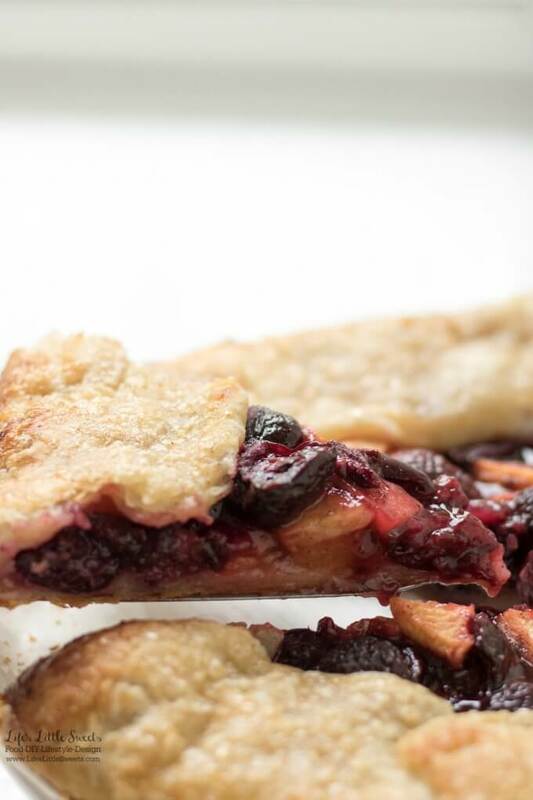 All the flavors of a fresh pie, without the fuss of a pie plate! 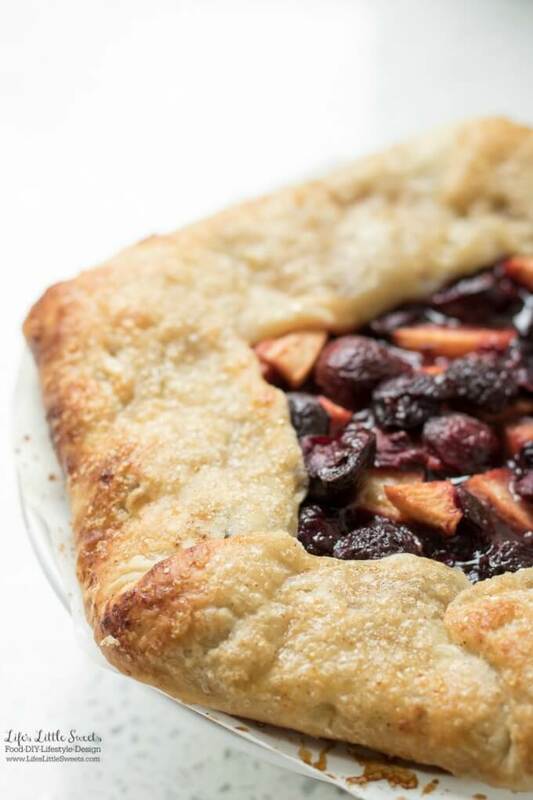 I know you are going to love this Cherry Nectarine Galette! Before starting, make sure all ingredients are cold to ensure the crust comes out flaky. The whole idea through this dough-making process is to keep the dough cold so that it comes out flakey when baked. In a large mixing bowl, mix 2-1/3 cups flour, 1 tablespoon sugar, 1 tablespoon apple cider vinegar or fresh lemon juice, 1/4 teaspoon salt and 1 cup chilled butter slices. Using a pastry blender, work the mixture until you get a crumbly texture with about 1/2-inch inch butter chunks. Starting with 1/4 cup ice water, gradually add the ice water into the mixture and using a large fork and then your fingertips, work dough until it just comes together into a ball. If it needs more ice water to form a ball, then you can add more and keep the ice water on hand in case you need more later if the dough dries out. Wrap the dough in plastic wrap to prevent drying and refrigerate for a 1/2 hour before rolling out. After chilling for a 1/2 hour, divide dough ball evenly in half with a dough scraper. Wrap 1 half of the dough in the plastic wrap and return to the refrigerator to use for another recipe. Roll the chilled dough out in an 11 inch circle, 1/4 inch thick. Cover the dough with plastic wrap and chill the dough while you put together the apple filling. In a large mixing bowl, mix the cherries, nectarines, lemon juice, cornstarch, sugar, Kosher salt, and ground cinnamon until combined. Line a rimmed baking sheet with parchment paper or a silicone baking mat. Place the chilled dough 11 inch circle in the middle of the lined baking sheet. Brush the pastry crust with the beaten egg and sprinkle evenly with Demerara baking sugar. Bake at 450 degrees for 20-25 minutes until golden. When it's done, allow to cool before serving, allowing the filling to firm up before slicing. Enjoy alone of with vanilla whipped cream and/or vanilla ice cream! You can take a shortcut with this recipe and get frozen pastry crust but I highly recommend my recipe for Double Pie Crust which I include. 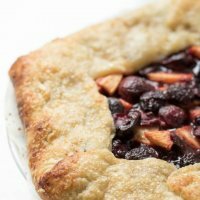 The Cherry Nectarine Galette recipe uses half of the Double Pie Crust recipe, so you can save the other half for another fruit galette.